The deepest depths of the ocean are filled with strange creatures that have adapted in the most diverse and unusual ways to cope with the cold, high pressure and darkness of the bottom of the ocean. Deep sea anglerfish are predators that have evolved to survive quite successfully in these harsh environments, while also being seen as one of the weirdest species of anglerfish found in the entire ocean. Deep sea anglerfish are among the most unusual and feared predators of the deep ocean, often known to roam the bottom of the sea at depths of several thousand meters. There are several species of deep angler fish, some of which have specimens that can grow up to 1 meter in length, or even more. Their characteristic large jaws, sharp teeth and – in some cases, a luminous organ that helps them hunt for prey – are the most well-known features of this unique species of fish. 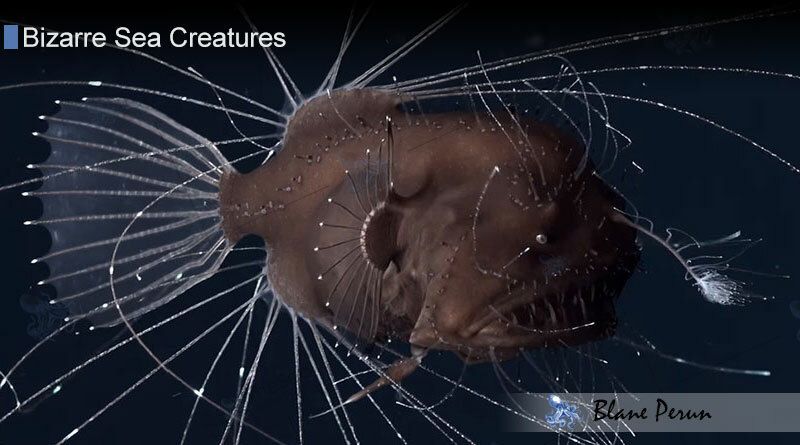 The esca – the luminous organ extending from the top of their heads – is one of the most distinctive features of the deep sea anglerfish. Worn by females, this organ is capable of producing light through an – as of yet, largely unknown – method based on bacterial growth. Scientists suspect that bacteria enter the esca through small pores and multiply within it, until their numbers are great enough to produce the light that the anglerfish needs in order to hunt. This “stylish” feature also helps the females of the species to attract mates more easily. Deep sea anglerfish have one of the strangest and – in some ways disturbing – reproductive cycles. The males of the species are known to roam the bottom of the ocean in search of viable females, only to then latch onto them with their teeth and gradually become parasites whose organs slowly become symbiotic with those of the female. A single female can often take several males into its body, physically fusing with them until the male parasites become physically dependent on the female host for their own survival. This strange symbiotic relationship is actually extremely important for the species’ survival due to the extreme difficulty associated with finding a viable mate in the depths of the ocean and the dependence that females have on having a mate close by as soon as they spawn. Also, it’s important to note that not all species of deep sea anglerfish rely on male parasitism and, in some cases, the male is the one most well-equipped to find viable prey. Anglerfish are opportunistic, low energy consumers that thrive in the depths of the abyss and the bathypelagic zone. The esca plays a major role in their ability to attract prey, while their large, fearful mouths and teeth close with extreme speed, often around whole fish, without the need to tear their prey into pieces before being able to eat it. In fact, their flexible and adaptable bodies allow them to sometimes eat fish even twice their own size. The deep sea anglerfish is able to produce significant amount of light through the esca and use it to attract prey such as pandalid shrimp and various types of crustaceans. Scientists have observed deep sea anglerfish to have adapted to become highly energy-efficient, so that they can linger for a long time at the bottom of the ocean without having to feed.